This video shows Step by step pictures of me building a 24X24 garage.The first video shows steps involving how to pour footings, walls, floors and framing,Installing trusses, etc and the second video go over construction ideas, tips, as well as the entire area of buying materials, building permits, and the paperwork required for building a 24’x24′ garage.Adding a garage to your property can give you a lot of additional storage, it will give you covered parking spaces to store your car, and it can add to your property value. A normal garage can cost upwards of $30,000 to have it built by someone else. 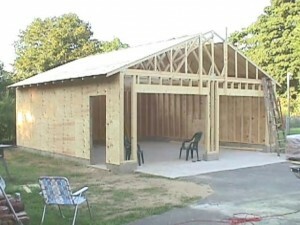 If you build it yourself, on the other hand, you can cut down significantly on the cost of it. For many people, this can be the difference between being able to afford a garage or not. It is a lot of work, however, it will save you a ton of money by doing this type of project yourself. Before you start this project, you should know what you are going to need. This will require a lot of concrete and a lot of wood. In this tutorial, you will be handling most of the wood work on your own. However, we recommend that you hire a concrete service to handle the concrete portion of the garage, as it is impractical to do this part on your own.You’ll need 2×4’s – 2×4’s will be used to create the skeleton of the garage,Plywood – These will be used to create a barrier wall and roof,Shingles – These will be placed on top of the roof,Windows and a Door – To install throughout the garage,Garage Doors – Used so you can pull your car in and out of the garage.